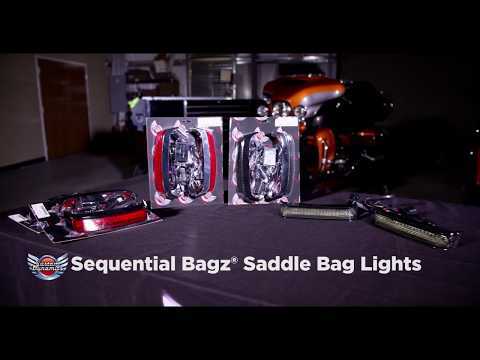 BAGZ™ add on saddle bag lights adhere under the lip of the saddle bag lid on Harley-Davidson® OEM hard saddle bags. Each side includes 86 super bright Red dual intensity LEDs encased in a chrome or gloss black housing with a smoked or red lens. BAGZ™ come with plug and play IP67 rated weatherproof quick disconnect to make future removal of saddle bags quick and easy. Lifetime Warranty Against LED Failure. Fits 2010-2013 Harley-Davidson® Street Glide (FLHX) and Road Glide Custom (FLTRX). Does not fit CVO™ models. Available in Standard plug & play configuration for Run/Brake function. Custom Dynamics® LED TriBAR required for Run/Brake/Turn function (sold separately). Use of the LED TriBAR requires wires to be relocated on plug & play adapter. We recommend using Posi-Taps for relocation (also sold separately). Upgrade to the Sequential plug & play configuration for Run/Brake function with Sequential Red Turn Signal. No additional modules required. Please note removal of the light may cause damage to the bikes painted saddlebag surface. Additional BAGZ™ Fitments also available for 2014-2018 Harley-Davidson® Touring Models, 1997-2013 Harley-Davidson® Touring Models and 2009-2013 CVO™ Street Glide, Road Glide, and Road King models.